These snow boots for fall and winter are made of spotted seal skin with the fur turned toward the outside. 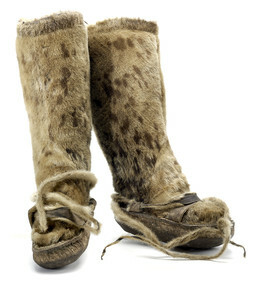 This style is also called mitquligaak, which means “including fur.” The soles are made of bearded seal hide. The boots would have been worn with warm fur socks and insulating grass pads. Kenneth Toovak: These are spotted seal. Spotted seal skin. Jane Brower: Qasigiaq [spotted seal]. Ron Brower: In the North Slope, most of our rivers in the Barrow region drain into the Dease Inlet. And Dease Inlet is where many of the spotted seals are captured because they’re eating. They’re feeding on fish, so they hang around in that area. Aron Crowell: And are there any other furs on there beside spotted seal? Ron Brower: The bottom is ugruk [bearded seal]. And there’s a seal skin with the hair removed, that’s been folded, and sewn to create a waterproof seal. And this has a wide stitch to it. . . . These are bearded seal soles with spotted seal body. Aron Crowell: And what’s on the very top? Ron Brower: It’s been sewn to create a tie. You tie your boots up here, and then your pants will come down either over that so they don’t slip. And then you can open them up a little bit to let the heat come out of your clothing. So you would be able to expand this when you’re doing a lot of walking. Then you would loosen that up, so that your feet are not sweating. Ron Brower: These would be daily wear when you’re on the land. There’s another kind of pair that you would use when you’re out hunting. So these would be everyday wear. And then you have a different style¾the waterproof boots, ulitchuixak [pair of man’s fur-in, knee-high, waterproof spring boots] that you would wear for hunting, especially in the spring for whaling. Kenneth Toovak: Ukiumiuvva atuġuugait marra, tainnasit samma. Ron Brower: These are made for winter use. And then there’s a different a similar styles of boots that have the fur either removed or on the inside. Kenneth Toovak: And then in the springtime, they use the skin with the ‘fur in’. Ron Brower: [The springtime boots] are called ulitchuixak [fur-in, knee-high, waterproof spring boots]. So these are called natchiviak [fur-out, knee-high sealskin fall boots], these style of boots are for winter and fall. Karen Brewster: Now are these waterproof? Ron Brower: No, they’re winter boots. Jane Brower: These are not really waterproof. Kenneth Toovak: And then in summer they scraped the fur off. They used the [scraped sealskin] boots for waterproof boots. Ron Brower: The style of sewing, which includes the style of sewing here, the crimping is made or sewn differently. Each pair or boots has a different style for stitching, when you’re sewing these types of boots. Aron Crowell: Depending on how it will be used?